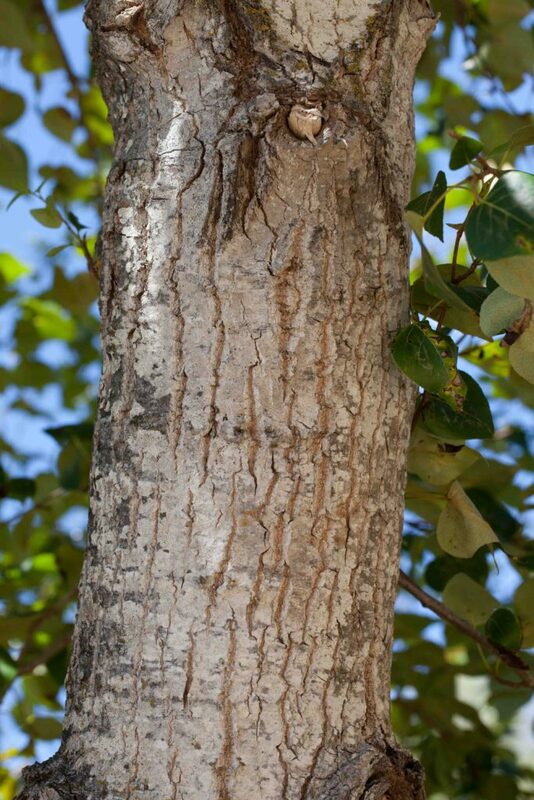 All members of this family are dioecious, with male and female flowers borne on separate trees. 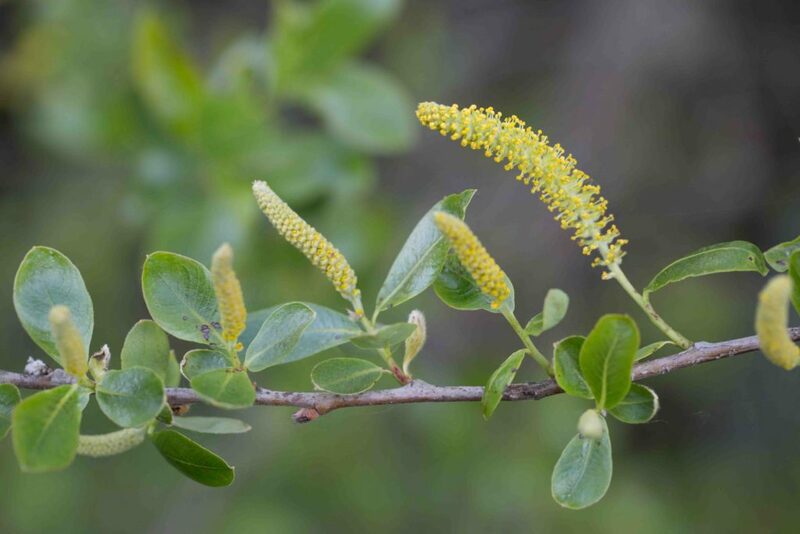 All produce catkins, the male catkins appearing yellow or red depending on the color of the pollen and female catkins appearing green until they ripen and release of fine, cottony seeds. 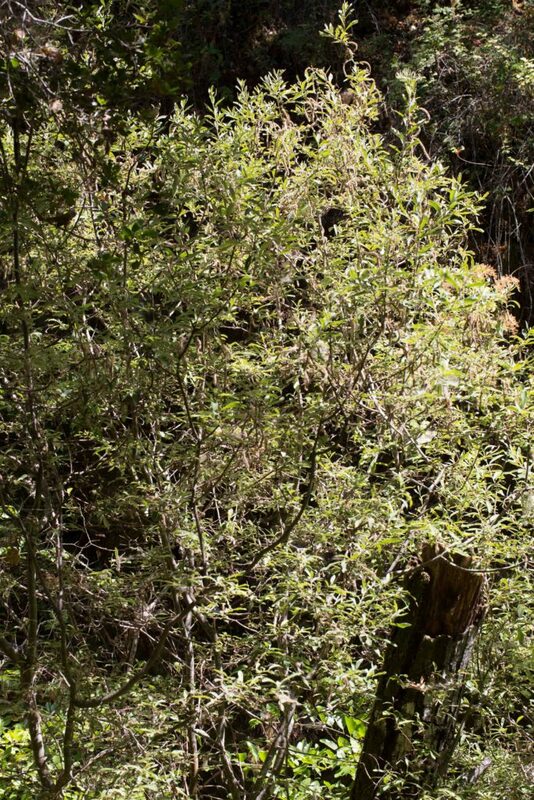 Distinguishing the willows can be tricky. 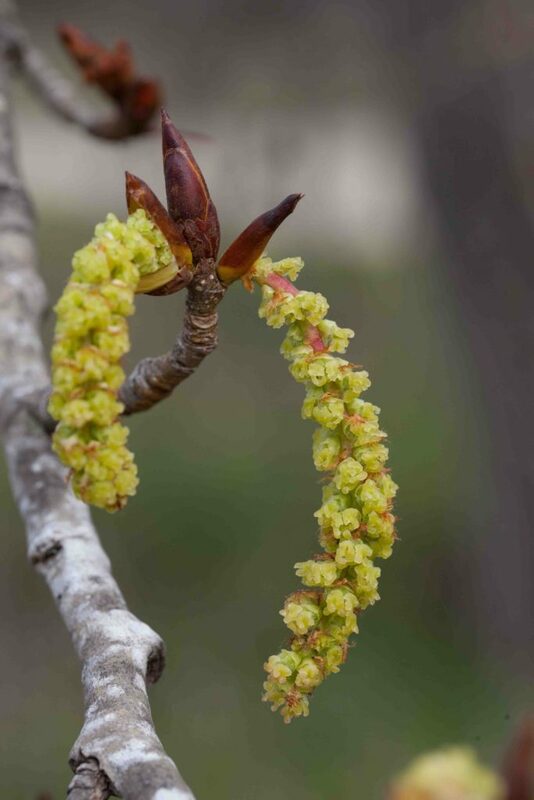 The shape of the leaf is generally critical, whether the leaves appear before, at the same time as or after the catkins can be indicative and, in some cases the number of stamens in each individual flower in the male catkin, something that can be seen with a hand lens but hard to see with the naked eye. 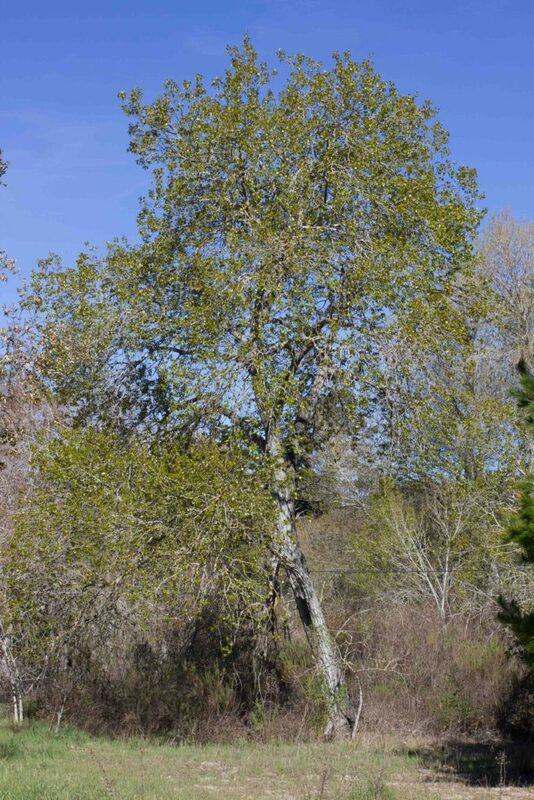 This is a very common tree with distinctive heart-shaped leaves, mid-green above and paler and glaucous below. Distinguishing male and female trees is impossible except while the trees are in flower or fruit. 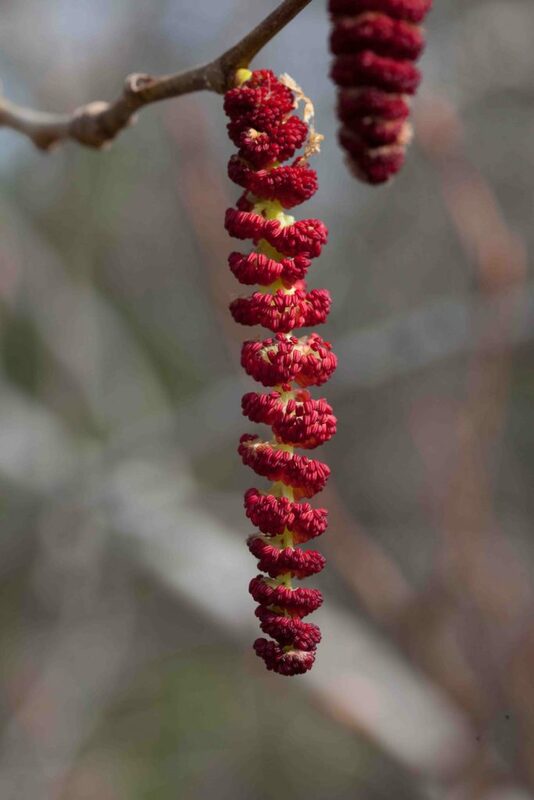 The long male catkins are bright red. 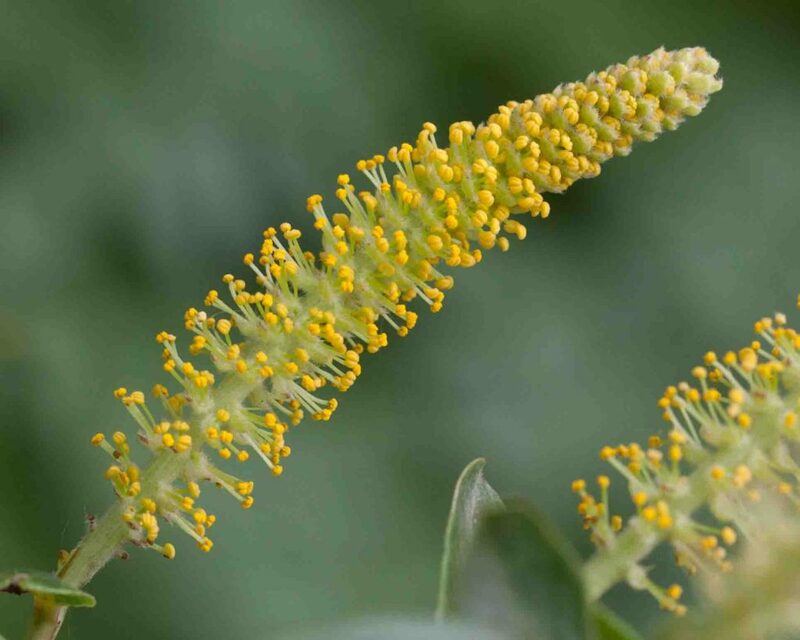 The shorter, fatter female catkins are green. When the fruits mature, they release large quantities of seeds covered in cottony hairs which can carpet the ground around the tree. The seeds and the outer covering are extremely sticky. 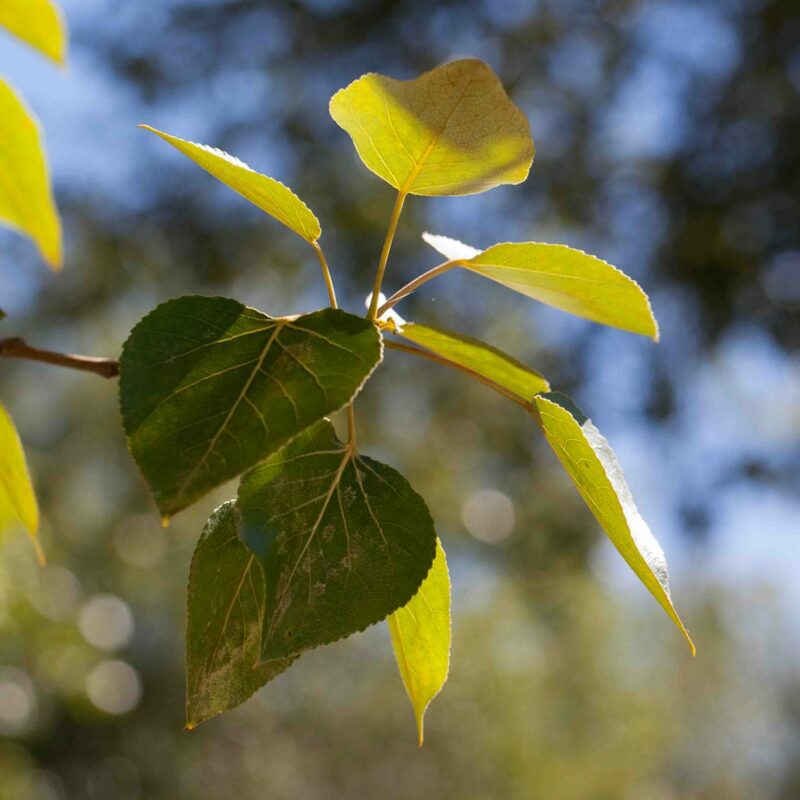 Like the tree’s relative, Quaking Aspen (Populus tremuloides), it is a joy in the breeze with the leaves turning and making their distinctive ruffling sound. The leaves also provide welcome color late in the fall. 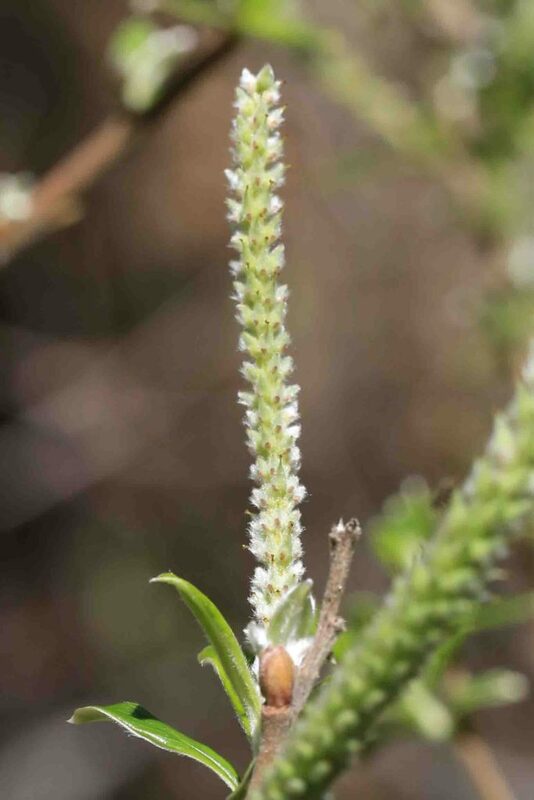 This is relatively inconspicuous but is one of the easy willows to recognize with its long (< 15 cm), very slender leaves with very fine, soft, silky hairs on the lower surface. 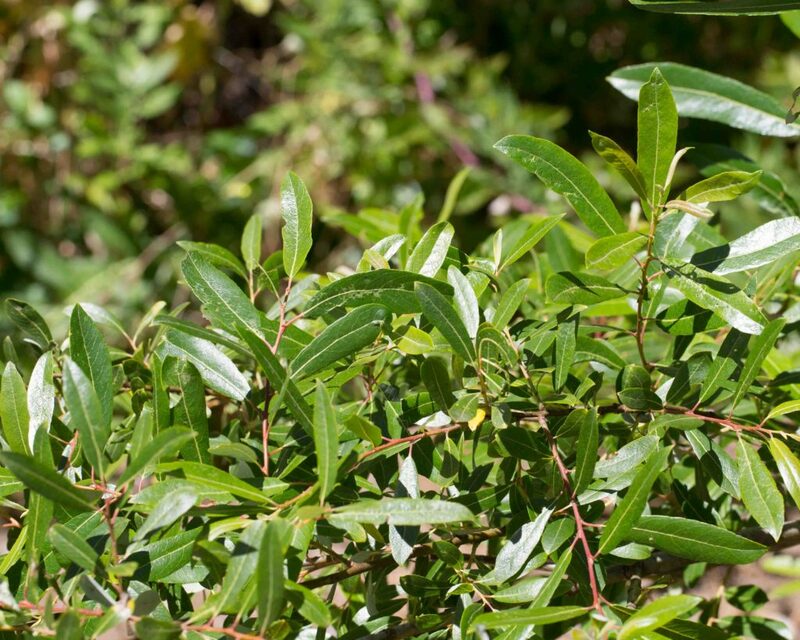 The leaves have fine, widely spaced serrations. 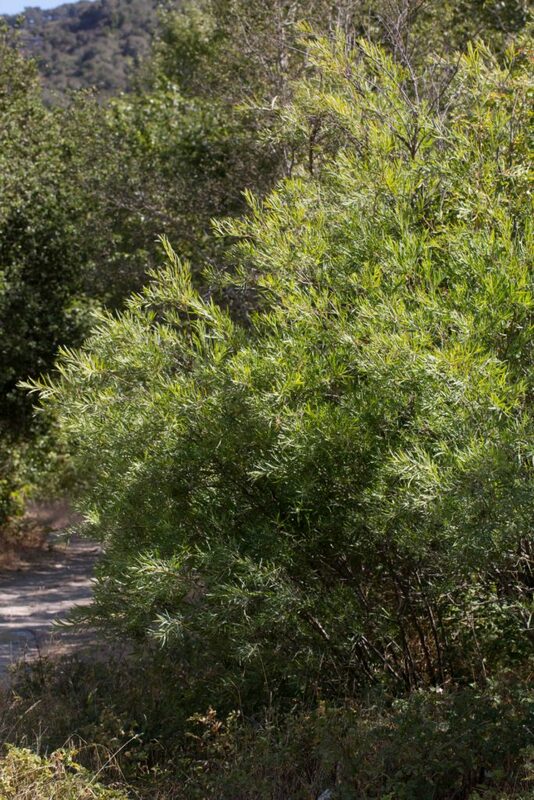 Sometimes a smallish tree but most often shrubby in its form. 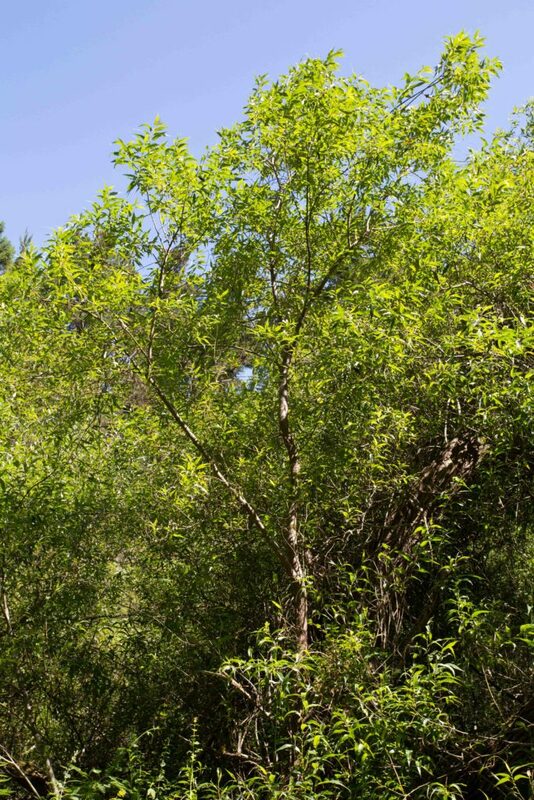 This is a common willow but easily confused with Pacific Willow (Salix lasiandra). 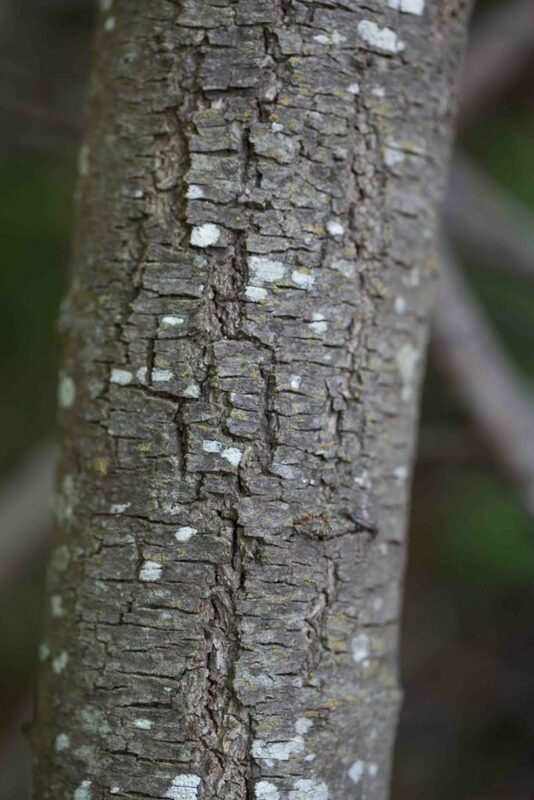 It is one of the taller willows with dark furrowed bark. 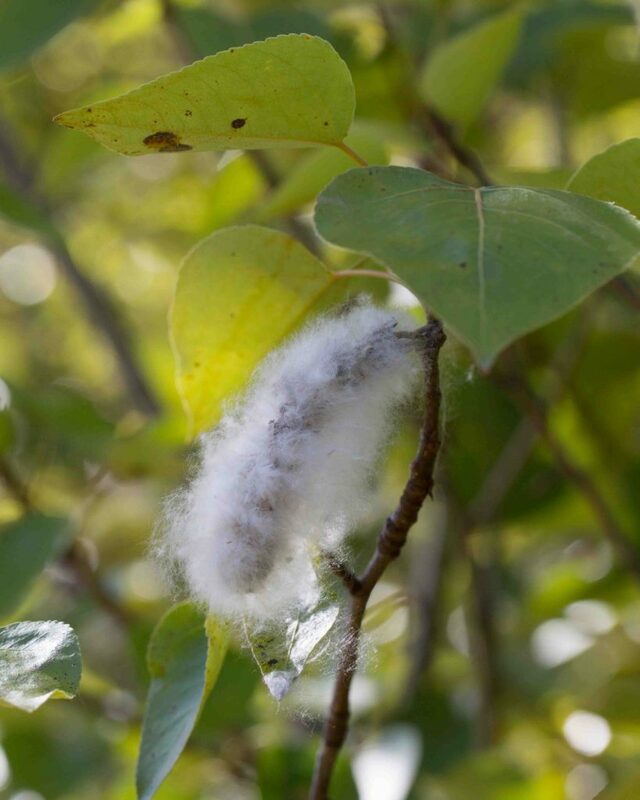 The catkins appear at the same time as or after the leaves appear. Male flowers have 5 stamens. 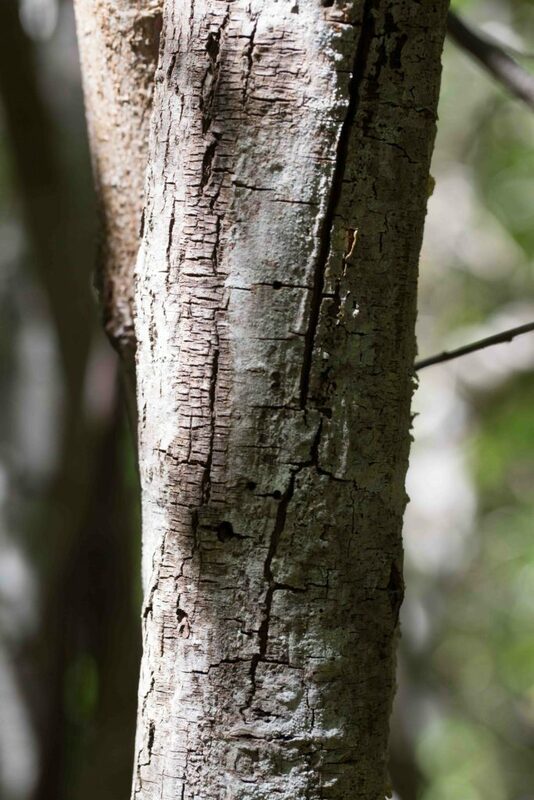 Twigs are yellow-to red-brown, though in practice this is not always a reliable indicator. 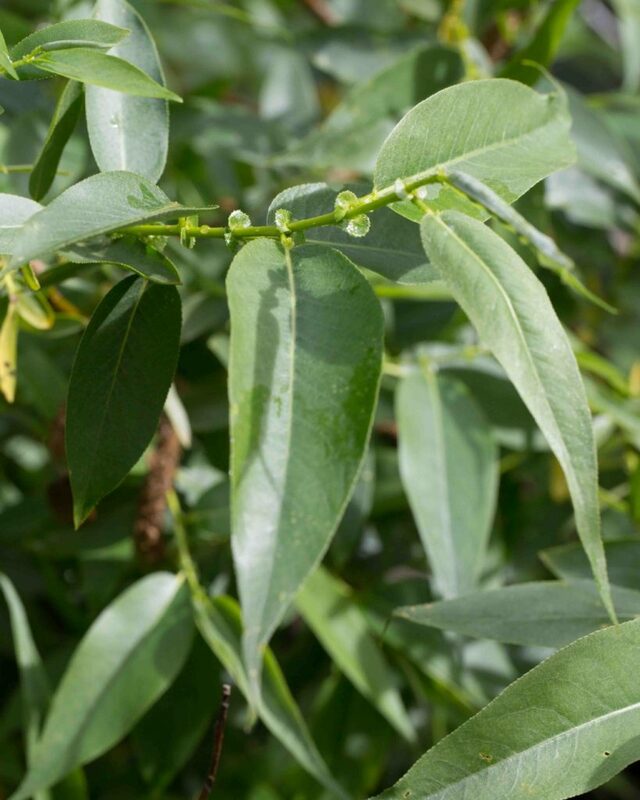 Leaves are 5–19 cm long, strap-shaped to lanceolate or obovate with acuminate tips. They are green to bluish-green above and bluish-green to whitish below. 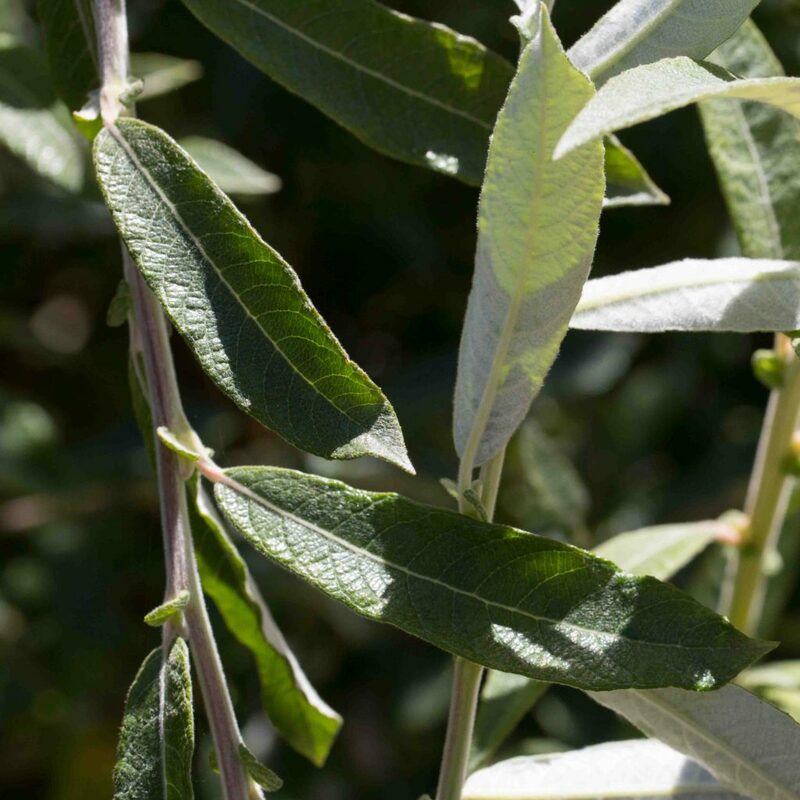 Unlike Pacific Willow, the base of the leaf blade has no glands. 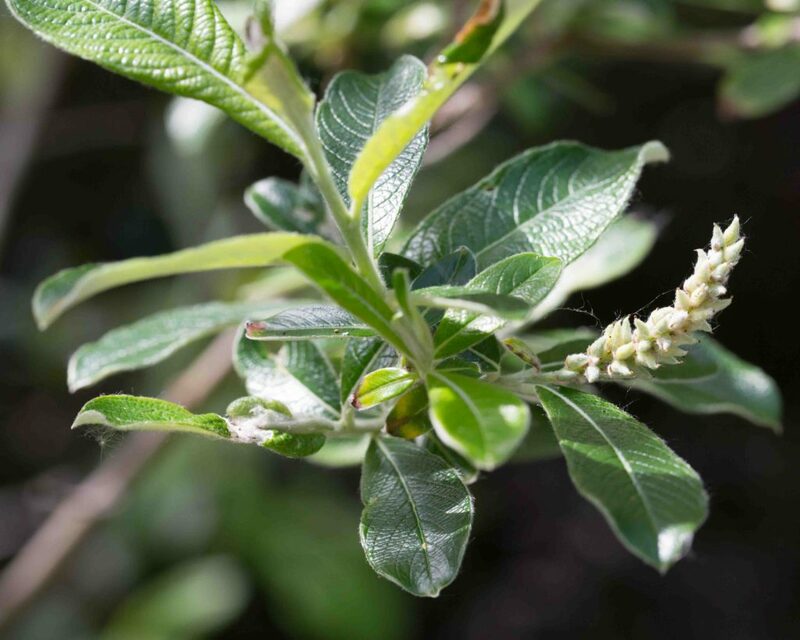 Although smaller, this is similar to Red Willow (Salix laevigata) and easily confused with it. The catkins appear with the leaves. Male flowers have 3–5 stamens. 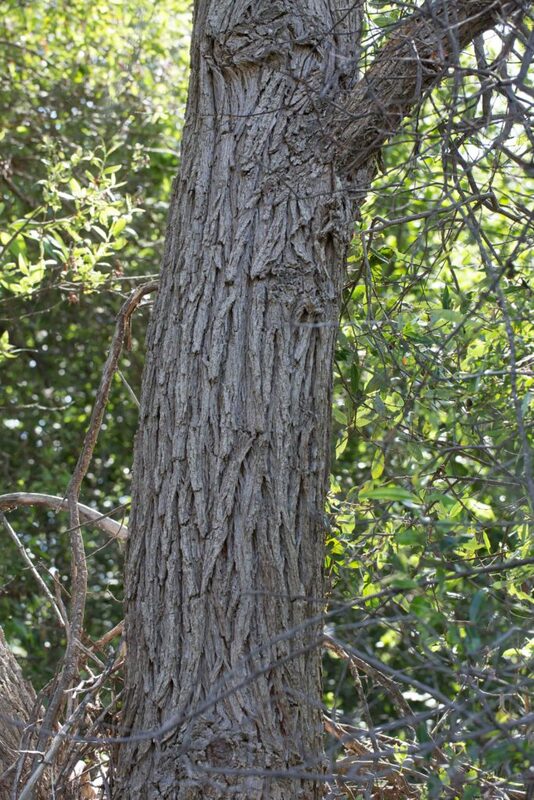 Twigs are yellow-, gray- or red-brown. 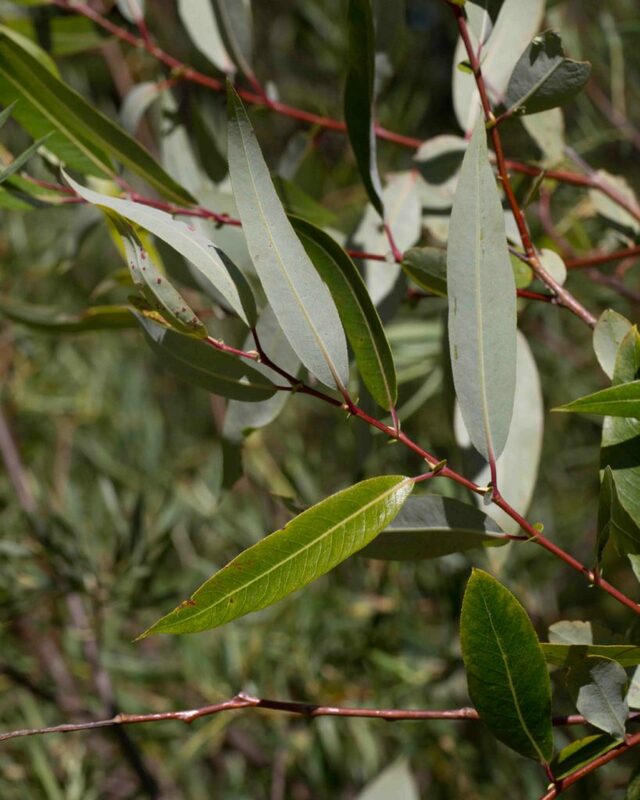 Leaves are 5–17 cm, lanceolate with acuminate to long-acuminate tips. 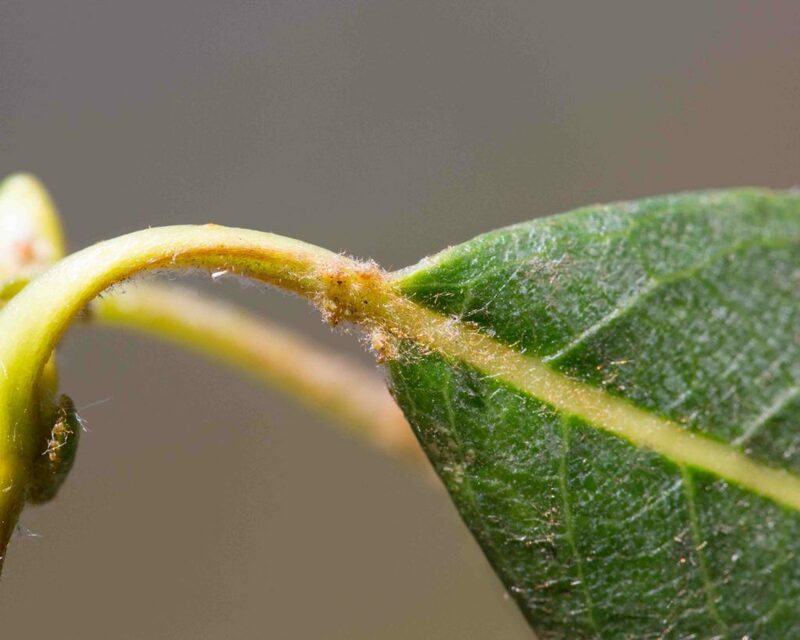 Most important, the base of the leaf blades generally have a cluster of small, spherical glands, something that the leaves of the Red Willow lack. 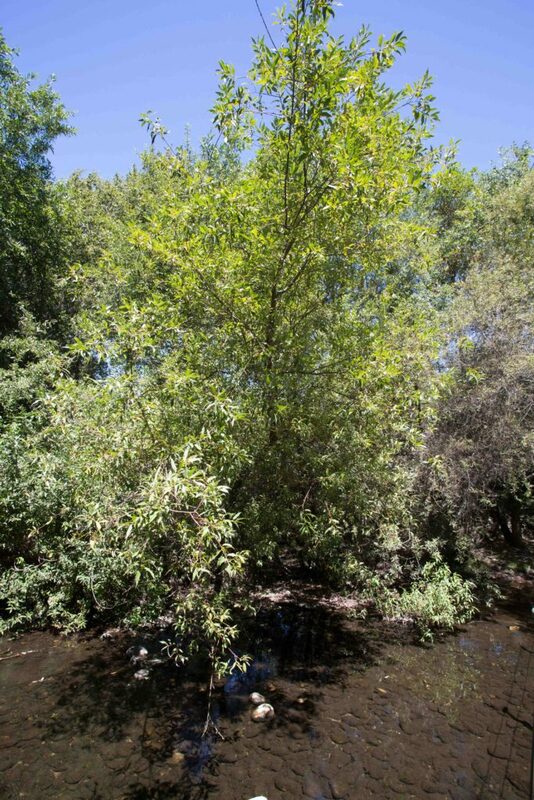 This is perhaps the most common of the willows, a relatively small widely spreading tree. 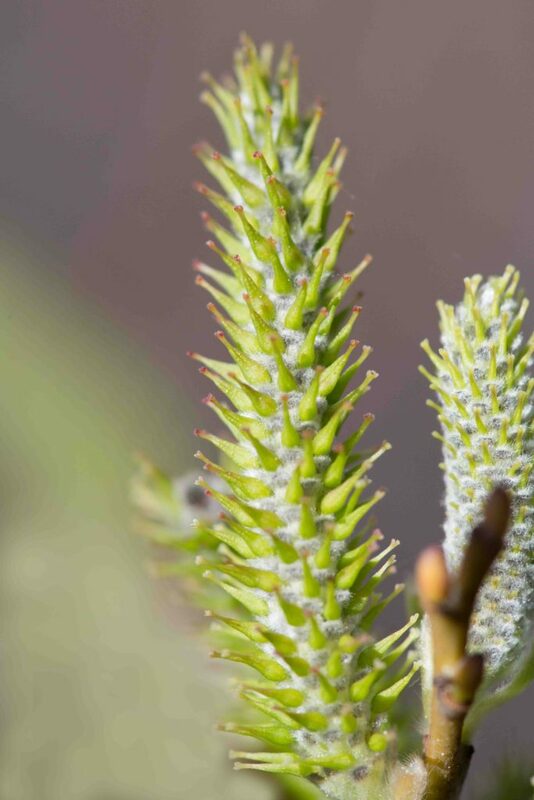 Unlike Red and Pacific Willows (Salix laevigata & lasiandra), the catkins appear before the leaves. Male flowers have only 2 stamens. 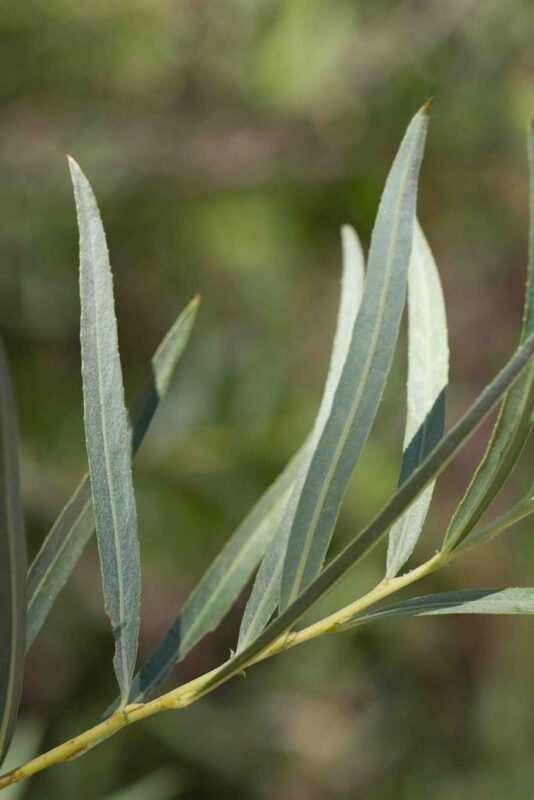 The leaves are strap-shaped to elliptic to obovate with a rounded or barely pointed tip, shiny green above and bluish-white below. 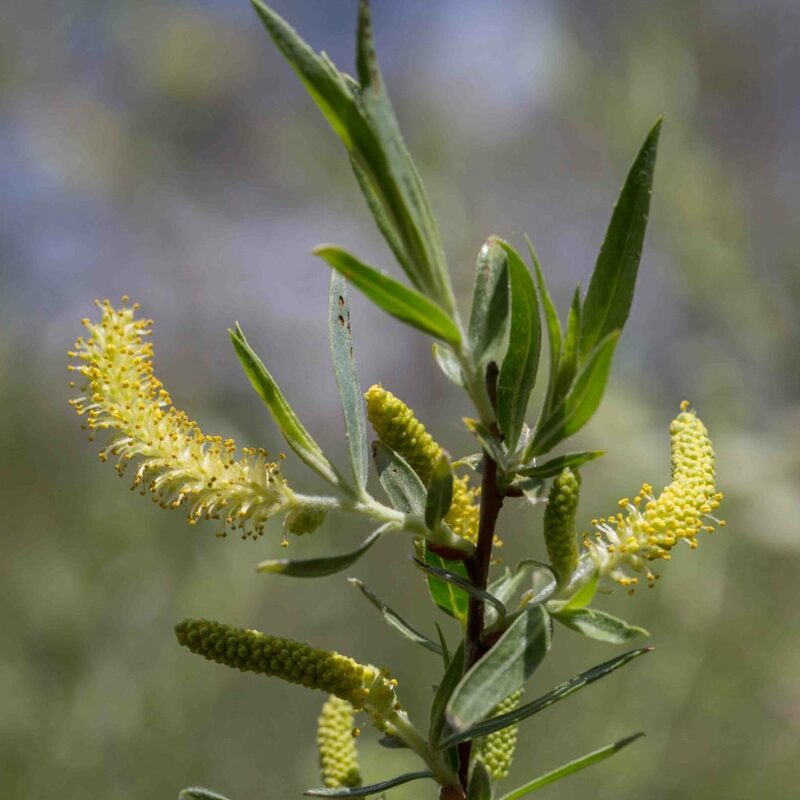 Although the leaves are extremely variable, they are quite unlike the sharply pointed leaves of Red or Pacific Willows, the narrow leaves of Sandbar Willow (Salix exigua) or the broader, tomentose leaves of Sitka Willow (Salix sitchensis), so it is easy to avoid confusion. 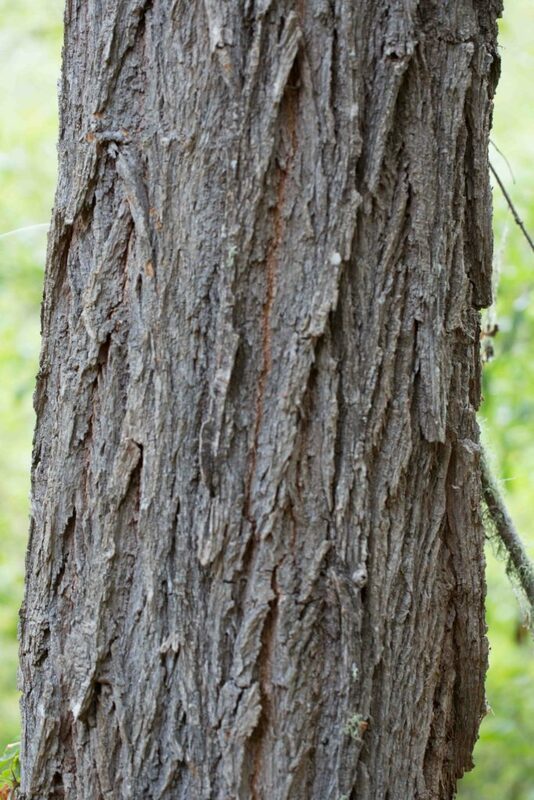 The bark is comparatively smooth, very different from the furrowed bark of Red or Pacific Willows. 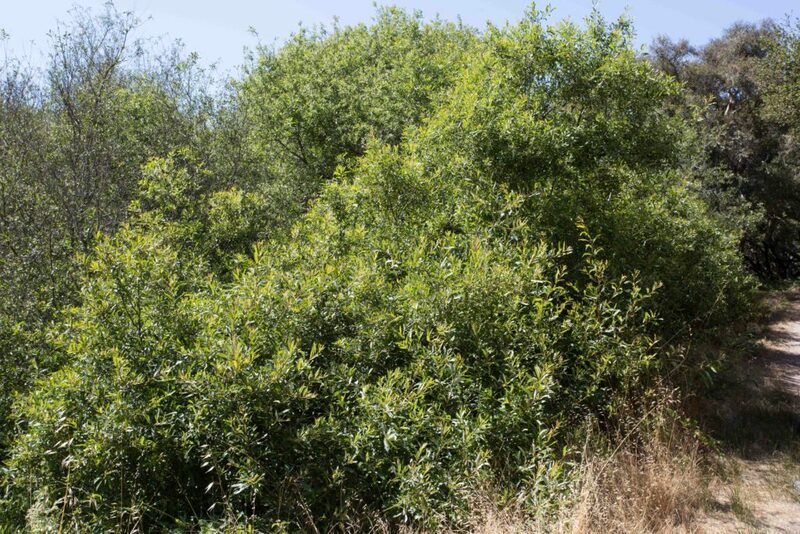 This is a less common willow, rarely found far from the coast. It has distinctive leaves, oblanceolate to obovate, dull green and sparsely silky-tomentose above, densely silky or tomentose below. Catkins appear just before or with the leaves. Male flowers have 1–2 stamens. 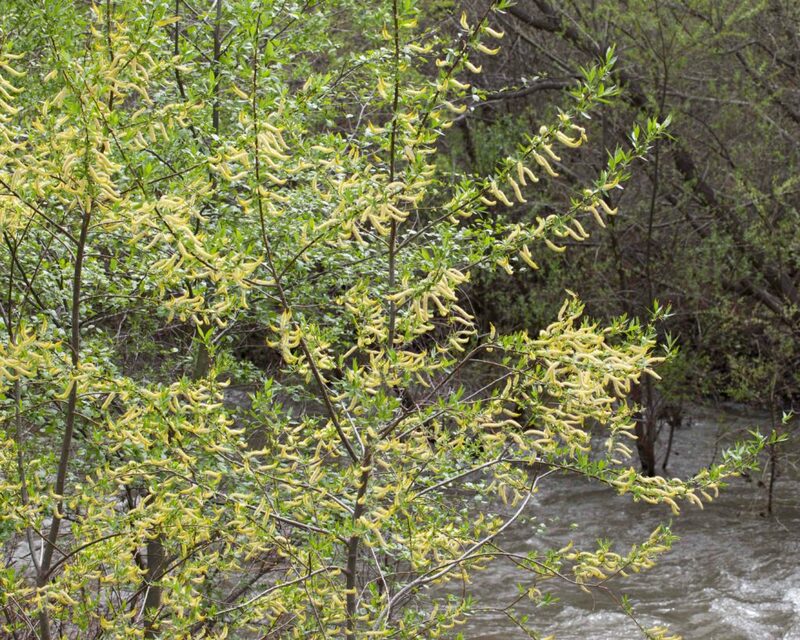 The catkins appear longer than those of most other willows. 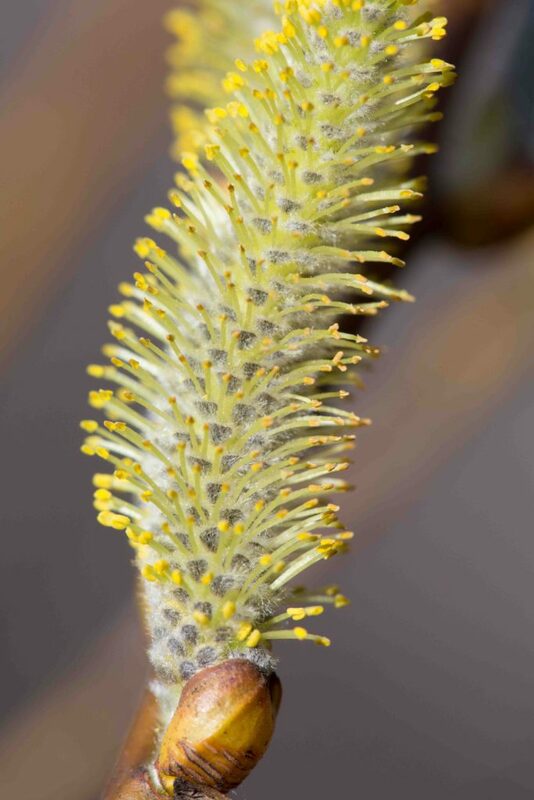 Female catkins have distinctive silky ovaries, unlike the glabrous ovaries on the female catkins of Arroyo, Red and Pacific Willows (Salix lasiolepis, laevigata & lasiandra). 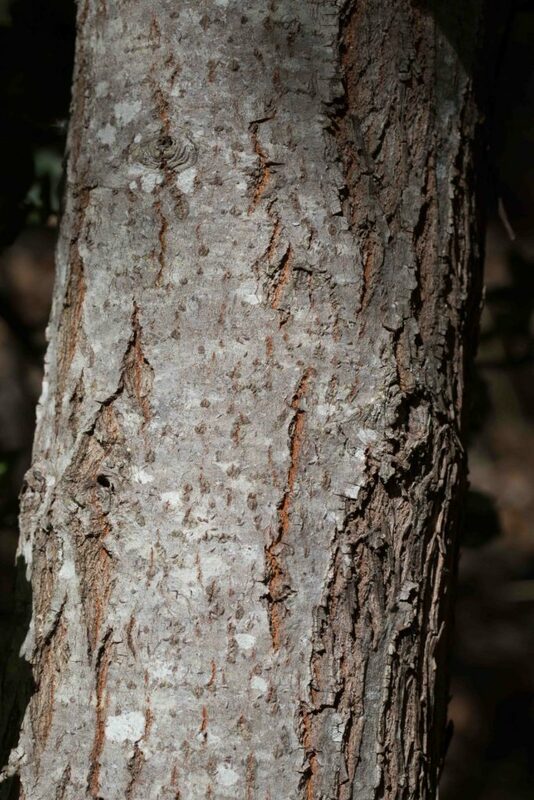 The bark is comparatively smooth.